Yesterday Bob and I attended the President’s Day Winter Ice Castle Extravaganza Festival in Mayville, New York. 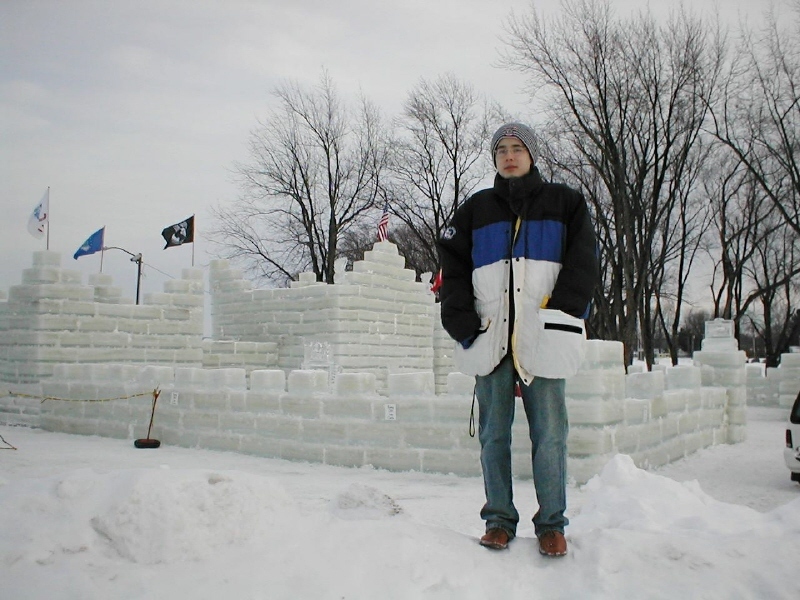 Mayville’s ice castle has the distinction of being the southernmost ice structure in the United States. 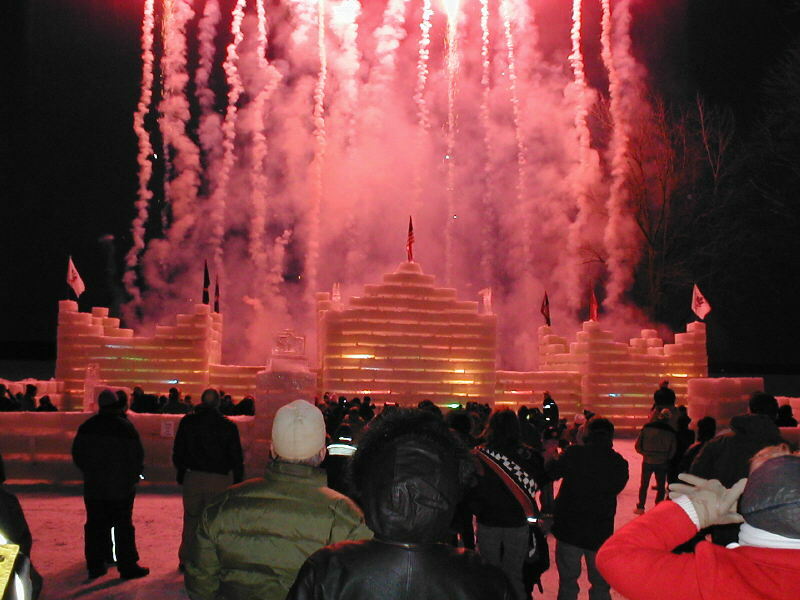 The first Ice Castle Extravaganza to be held in Mayville was in February 1987. This is the fourth time I have seen an ice castle at Mayville. The first year was in February 2003. Bob and I took Leo, our exchange student from Brazil, to see the ice castle. Leo was our only exchange student who had never seen snow. I remember Leo asking when would the snow begin. I also remember Leo asking when would the snow end! 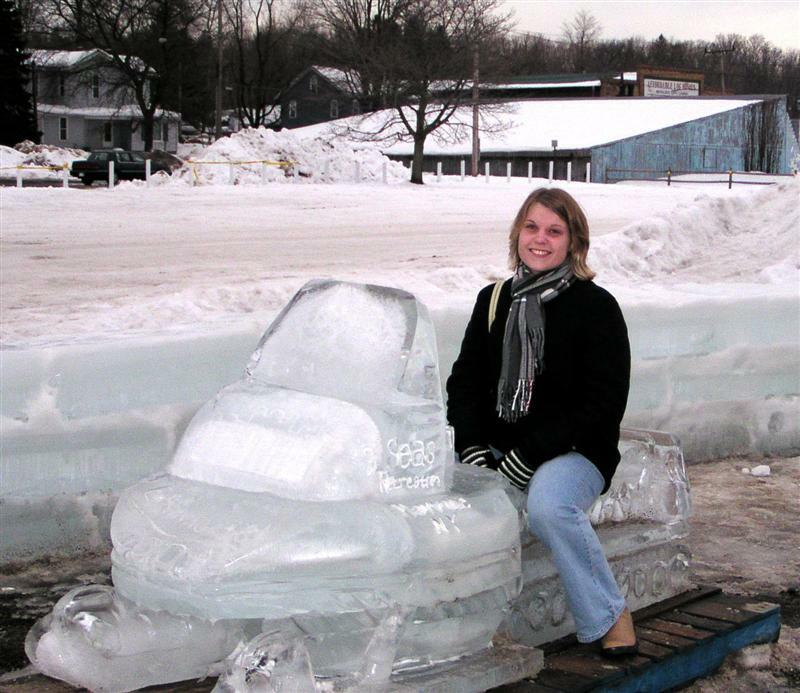 The next time I saw Mayville’s ice castle was in February 2004. Camilla, our exchange student from Denmark, and I saw the ice castle AFTER the festival had concluded. We couldn’t go during the festival weekend because we were attending my father’s funeral that year. Last year we saw the ice castle, driving through Mayville. Bob stopped the car long enough for me to snap a picture. 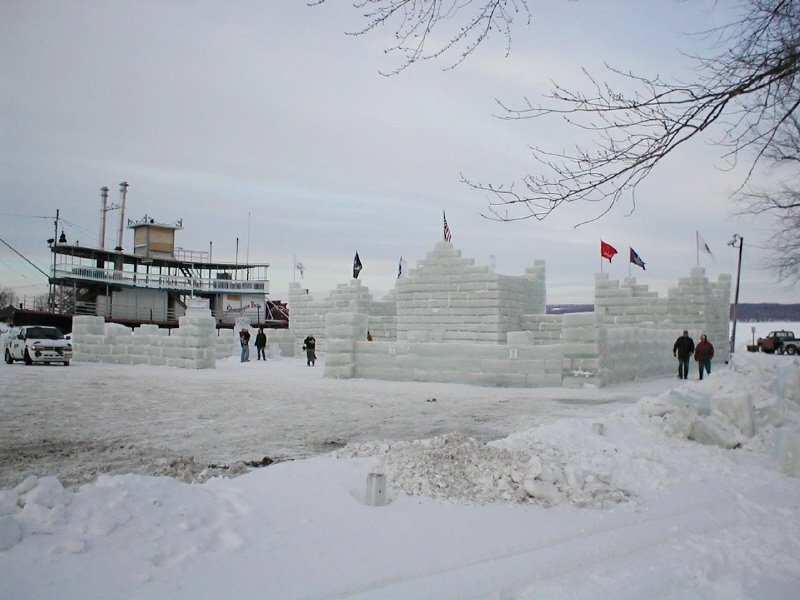 If you are ever in the area during President’s Day weekend, be sure and include a visit to Mayville’s Ice Castle Extravaganza in your plans. It is well worth a visit! The ice castle looks like a stone castle. Too good! That is really something to see! Beautiful! How many hours does it take to get done usually? That Ice Castle must be something to see. Probably took allot of time and energy to make it. Nothing like that around here, that I know of. Trails of a Traveler – Thank you; I had hoped my photographs would show good detail of the blocks of ice that were used to build the castle. 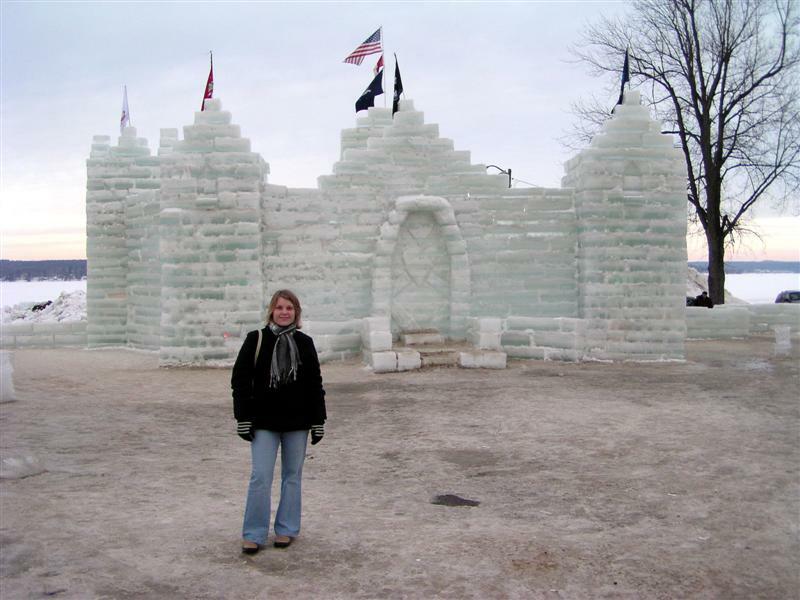 The castle is an astounding ice structure!Bush Babe – Thank you for “coming on over” to my part of the world. I will visit your part of the world through you; I am now following you. Thanks to Debby for bringing us together!Ciss B – I found these statistics on the building of the 1996 ice castle. “The 1996 castle was 20 feet high and 120 feet long and consisted of 1,150 blocks, or 230 tons, of ice, each block weighing 400 pounds. It took 20 to 25 men 1,280 hours over eight days to construct this object of beauty.” I do not know the measurements of this year's castle; however, I was told that it was one of the big ones. So I would assume that it took as much or more time to build as it did the castle in 1996. Corker2 – You aren't too far from Mayville, NY. You should visit the castle yourself sometime! These are really “cool” shots! I have never heard of this festival. Sounds like a great destination for a daytrip! Thanks for sharing. Wow, those ice sculpures are just amazing. What a neat thing to see! Wow, that is way cool! Nice Valentine photos also. What a ice sculptures. I like to attend these types of ice sculptures.